Mimaki has announced the launch of the Mimaki UCJV300-160 and UCJV150-160 roll-to-roll UV LED printing and cutting solutions. These two systems add creativity to the production of signs and display graphics. 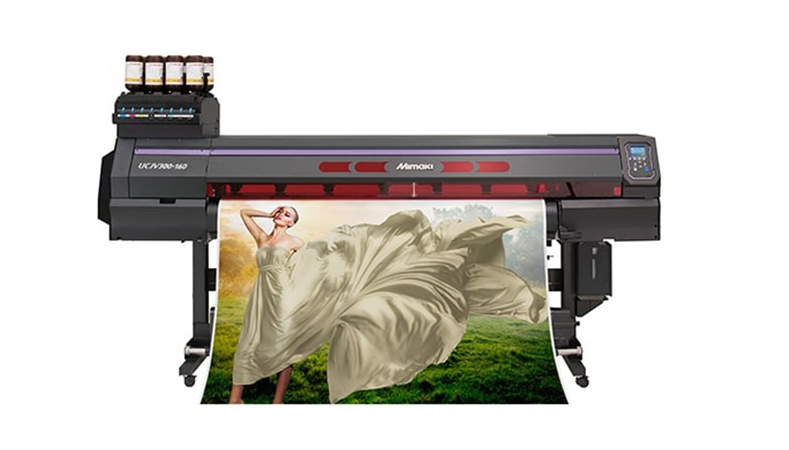 In bringing this solution to market, Mimaki is also introducing a brand new environmentally friendly ink, LUS-170, guaranteed to ensure vibrant, eye-catching print results. The UCJV Series is expected to be available for customer shipments in the fourth quarter of 2017. "The UCJV Series is available in two models: the four-colour UCJV150-160, and the UCJV300-160 that can accommodate up to seven ink colours in cost effective one litre bottles," commented Mimaki Europe general manager sales Ronald Van den Broek. "Each can produce a wide variety of print-and-cut applications offered by many signage, commercial and packaging print service providers. UV-LED curing technology enables print service providers to utilise an expanded range of media including uncoated print media and many thin film substrates that may be too heat sensitive for latex or solvent high heat fixation systems." Four-layer printing – for example, colour, black, white, colour – is available on the UCJV300-160 model and offers an enhanced print capability that allows designers to build layered, transformative graphics for backlit applications. This gives print service providers the opportunity to offer something unique – a dynamic graphic that ‘morphs’ its image or colour scheme depending on the light source. The integrated cut functionality enables volume production of labels, decals, window clings, floor graphics, POP displays, vehicle markings, packaging or prototypes in a single unit. Additionally, UV ink technology prevents common problems such as film separation and other issues related to post-cutting that can occur with solvent and latex inks. UCJV Series prints are instantly cured allowing users to print rapidly and immediately move to the finished product. For many jobs, instant drying, high scratch resistant UV printing can also eliminate the need for additional finishing like laminating, enabling print service providers to reduce cycle time while benefiting from additional cost savings. Instead of working with solvent ink, which requires drying time and a period to let off the gasses created, Mimaki has released a more environmentally-friendly ink that also dries faster. Prints are instantly cured, even when printed at high speeds. The new LUS-170 still guarantees vibrant colour despite not using more traditional technology like solvent and latex inks. It allows printers and designers to create semi-opaque films, reduce waste, and has the ability to see graphics from both sides. Mimaki’s Advanced Pass System aims to reduce visible branding, and Variable Dot Printing uses smaller drops to produce smoother gradations and bigger drops create uniform solids. The Waveform technology makes sure the correct ink drop is used. The new systems will ship with updated RasterLink6 plus Rip software. This version includes an ID Cut function that automatically programmes the printer to begin its cutting process. It also includes a FineCut plug-in for Adobe Illustrator, allowing a print preview for four-layer printing that enables operators to preview the transition day/night effect before printing. RasterLink6 plus now also supports PDF 1.5 and above. More complex cutting strategies are also available to the printer, who can now use a ‘half-cut’ where a small connecting piece is left between two sheets, allowing for even less waste. The printer/cutter is perfect for a series of products, including labels, graphics, packaging and vehicle markings.